Although this story happened during a war in France, it was written by Victor Hugo (think Les Miserables), a great friend of the Serbian people who helped raise money for them in 1896 and afterwards. A mother had been driven from her home with her two children, wandering through the woods and fields for days, living on roots and berries. On the third morning they hid is some bushes when they sensed the approach of soldiers. An officer ordered a soldier to find out that was stirring in the bushes and he found the mother and children. They were brought to the captain, and when he saw they were starving, he gave them a long loaf of brown bread. The mother took it eagerly and broke it into two pieces, giving a piece to each child. The surprised soldier looked at the officer and said, "Is it because she is not hungry?" The captain immediately replied correctly, "No soldier, it's because she is a mother." Every true mother lives for her child. Thank you, Victor Hugo and all mothers everywhere! Refugees are in the news in 2015. I saw this photo posted by "Milo Rad" of his family coming to America as refugees on Facebook ( 11/19/2015) and immediately knew that I just had to ask for his permission to post it here, for posterity! This is a beautiful (I think its an award-winning one!) photo of some very "Grateful to America!" 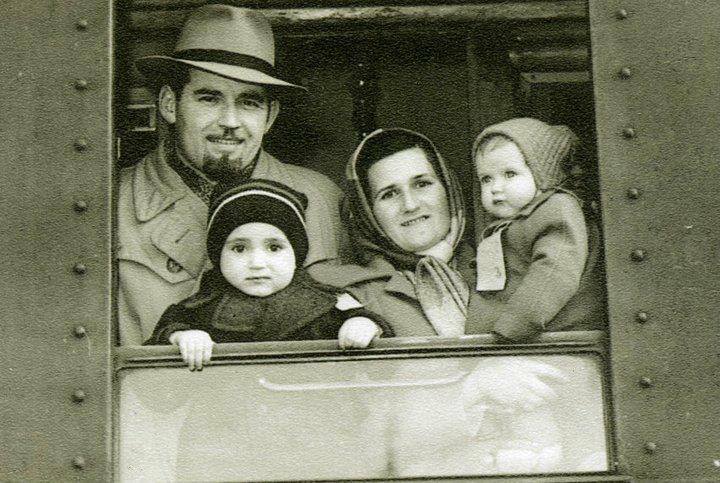 Serbian refugees who came in 1950: Proto Dushan Popovich (age 28), his wife, Protonica Radojka Popovich(age 26), son Milorad (age 2.5) and daughter, Jovanka (1). Both children are wearing name tags to insure they wouldn't get separated and lost from their parents who worried so much about them and their future! Just think about all the things this family was able to bring to America's table since 1950! Thank you, Popovich Family! Dana Maksimovich, the Serbian American who won an Oscar for her co-directing of the movie "CRASH", sent this info Feb. 1, 2010 by email. "This time the 25th Anniversary of WE ARE THE WORLD is for Haiti. They will air a 3 minute clip during the opening ceremonies of the Olympics on Feb. 12th, a music video will be made and a TV/Movie -- shot it in 3D. Paul Haggis directed it, I was one of the producers, and hubby, Chris was our Still Photographer (lots of pics if you wanna see them)! We shot it all day yesterday, and it was pretty cool!!! Paul also started a charity last year called Artists for Peace and Justice. I am helping him with it in between production work and baby! 100% of the proceeds go to Haiti relief. Check out the website: artistsforpeaceandjustice.com or the PEOPLE magazine that is out on news stands right now. We had an event at his house last week that helped raise $4.5 million! Please pass the word, it is a great cause! This photo was unveiled on Feb. 4, 2010 San Pedro, CA. The monumental work called LONGSHORE was done by Slobodan Dimitrov, a photographer based in the Long Beach/Los Angeles Harbors. He has been a contributing photographer for many labor publications, newspapers and magazines. To date, he has had over 130 exhibits, nationally and internationally. His documentary on the Ironworkers' retrofit of the Vincent Thomas Bridge has been exhibited at the Harbor College Art Gallery. His most recent work on the Piledrivers was exhbited in 2009, at the Warschaw Gallery. Recently he received an artist fellowship award for 2009 from the city of Long Beach, CA, from which to pursue documenting women in maritime construction trades. His current completed project: 100 years of Industrial Los Angeles for the Los Angeles Public Library. Current ongoing project: Photograph 150+ artists in the Port of LA, commissioned by Angeles Gate Cultural Center. We're proud of his many accomplishments! Ziveo! P.S. Be sure to check out Slobodan's photos on the Patriarch Pavle page on this website too! Thanks to great friend Steve Kozobarich from Cleveland, OH, we learn about Serbian composer, Josif Runjanin. 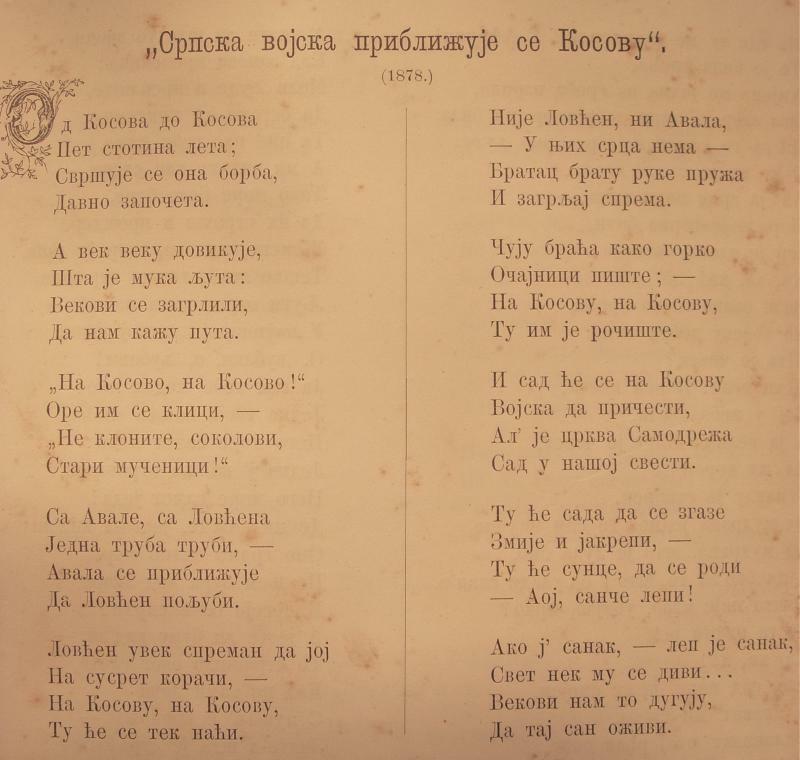 He wrote the patriotic song of "Rade Ide Srbin U Vojnike" (Readily Goes the Serb to the Military to Defend"), but few people know that it was he who wrote the stirring music (not the words) to the Croatian National Anthem. Wikipedia tells us that the Runjanin family originated from the village of Runjani in Jadar, in the Drina valley, moving to Bijelina in Bosnia in 1718 when Austria took over Serbia and Northern Bosnia. The family fled again, participating in the Second Great Migration of the Serbs in 1739 when Serbia and Northern Bosnia were returned to Ottoman rule. The settled in the area of Osijek in the Austrian Empire controlled area of Slavonia. George (Djordje) Runjanin settled in the village of Grk. His son Stojak was a SERBIAN ORTHODOX priest in Kuzmin to his death in 1748. 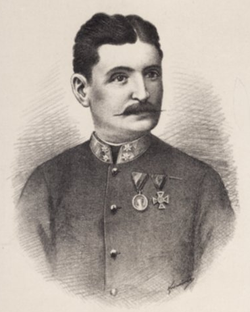 Stojak fathered Vasilije who was the father of Petar (another Orthodox minister) and whose son Ignjat (1798-1876) was an Austrian army captain in Vinkovic. Josif was the eldest of Ignjat's 7 children. Josif was baptized in the Orthodox church of Silaska Svetog Duha (Descent of the Holy Spirit) in Vinkovci. He was named "Josif" in accordance to Biblical traditions of Serbs of his age. (My maternal grandparents named their first-born son 'Josif' so I know this to be true! 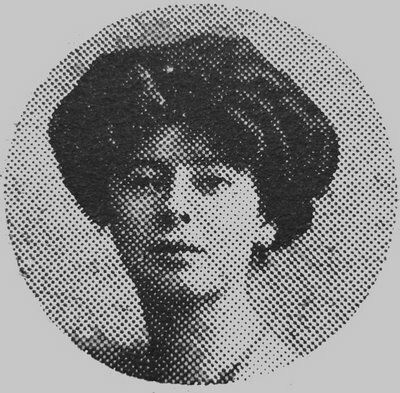 1901). 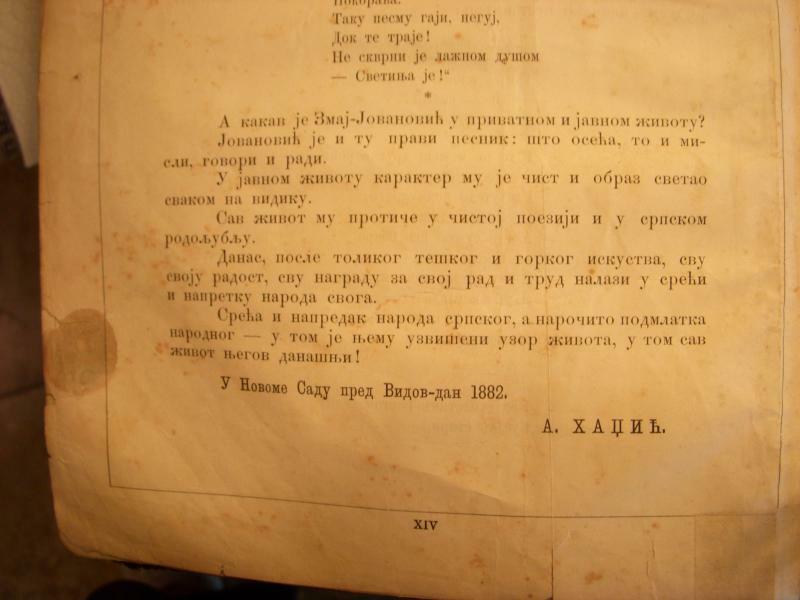 He served in the Imperial Army as a cadet in Glina, Military Frontier (Militarie Kordun) and it is there he met Antun Mihanovic, the writer of the words to the Croatian National Anthem. Josif was later made colonel, died at the age of 57 in 1878 in Novi Sad. Both of his songs are still popular to this day. My name is Catherine (Gimbus) Bogovich, a WWII Veteran, T-51 Corporal who served in the W.A.A.C. and W.A.C. from 10-15-42 to 12-4-45 in the European Theater of Operations. I was attached to the 3341 Signal Service Battalion, in Paris, France, from April to November, 1945. Paris is such a beautiful city. Luckily, it was not bombed during the war. Anyway, while walking I stopped at one of the store front windows to look at some blown up war pictures of atrocities. As I kept reading, I was VERY SURPRISED to see YUGOSLAVIA printed above the doorway. Well, that got my attention immediately, being a Serb, I had to go in and see for myself what this was all about and I’m glad that I did. This was Yugoslavia’s “Public Relations” building, showing pictures of the atrocities and the Holocaust inflicted on their poor suffering people. As I entered, there were men in uniform and civilians sitting around tables doing paper work, etc. Some glanced at me and saw that I was an American in uniform. I walked over to look at more pictures on the walls. One of the men approached me and began speaking in very broken English. I listened to him and then answered him in Serbian. He was so surprised and said, “Ti si Nasa!” and gave me a big hug. By then the others were all aware of me speaking their language and began asking me questions and telling me who they were and what had been happening. They had all escaped Yugoslavia. They were from the Royal Army, and Royal Air Force, the civilians were Chetniks, some had their caps on which we are so familiar with today. I heard so many stories that day that brought tears to me eyes. These were my people. The war in Europe had ended in April on VE Day, but they could not and would not go back to Yugoslavia as it was now occupied by Tito and his Communists. I made so many friends that day and returned to visit them every chance I had. I took my monthly Rations to them and whatever I got from family and friends back home. I gave them chocolates, cigarettes, some of my K&C Rations, nylons (to give to their women). Whatever I had, I shared with them. Kay said she shared this story because they say when a Veteran dies, a library burns. 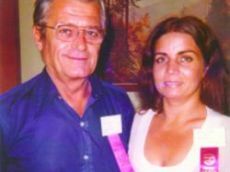 Many thanks to good friend, Elaine Mitrovich, for sending this website about her lifelong friend, Mimo Milosevich, and his car business in Galveston, TX. Now, I'm not going to advertise for everyone who has a business, but Mimo is "Mr. Serbian" in Galveston. He's so proud of his background, just like Elaine and her family are. Even his website mentioning his grandparents attests to that, so, if you're in need of a car, check out Mimo in Texas! Who can't recall the movie "Norma Rae" when Sally Fields, playing the hard-working Norma Rae (Cyrstal Lee), jumps up on the table after she was fired for her union activities, shows the sign "UNION" she had just written, and yells "U-nion! U-nion!" and amidst all the din of the machinery back comes the chorus of "Yun-ja! Yun-ja!" as her fellow workers shut down their machines one-by-one and "Norma Rae" is finally hauled off by the police. Crystal Lee (Norma Rae in the movie) had attended a meeting of the fledgling union, organized by then 55-year old Eli Zivkovich. Eli was a former coal-miner from West Virginia, who always attended the St. George Serbian Orthodox Church in Masontown, PA, whenever he was in town. 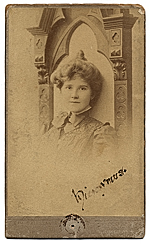 Zivkovich convinced her that the only way the textile workers would get better treatment from the company would be to form a union, so she became his hardest working volunteer organizer in one of the famous union organizing campaigns, which would eventually be known as the Amalgamated Clothing Workers Union. The real Norma Ray, Crystal Lee Sutten, died 2009 at the age of 68 in Burlington, NC. A good story about the two can be found in the 1980 story in the Washington Posst ("Through the Mill with Crystal Lee and 'Norma Rae', The Labors of Crystal Lee Sutton" by Megan Rosenfield, June 11, 1980, final edition. A good story about George Vukasin and his family who own the PEERLESS Coffee & Tea Company in Oakland, CA appeared in the San Francisco CHRONICLE on Thursday, Nov. 5, 2009. It was written by Chronicle Staff Writer, Janny Hu. 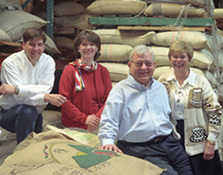 1s coffee beans were roasted in 1924 by John and Natalie Vukasin in Oakland, California! Peerless just celebrated its 85th Anniversary, so its older than Peets or Starbucks and is still going strong after all these years. 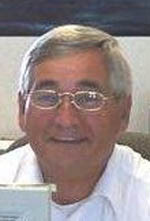 "John Vukasinovich was just a teenager when he immigrated to the United States from Yugoslavia in the early 1900s. After working in the Nevada gold mines, he settled in Oakland and founded Peerless Coffee Co. in 1924. When Vukasinovich died (the name was shortened), George Vukasin Sr. and his wife, Sonja, took over, building its warehouse on Oak and Third streets in 1975. Today, Peerless is an Oakland institution, much like George Sr., who has served as the city's port commissioner, councilman and coliseum president. The company headquarters span nearly an entire block. There's the machinery room, where beans are roasted all day, every day; a retail store, where customers can buy coffee by the pound or cup; even a museum that houses Sonja's collection of coffee artifacts. 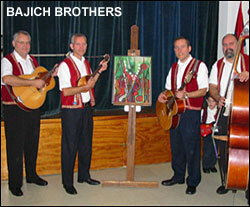 A testimonial banquet was held at the Serbian American Cultural Center, 1000 Colliers Way, Weirton, West Virginia. Brochures advertised: "We hope that you can join us on this day and celebrate a director who has given of himself to help others enjoy life through music." 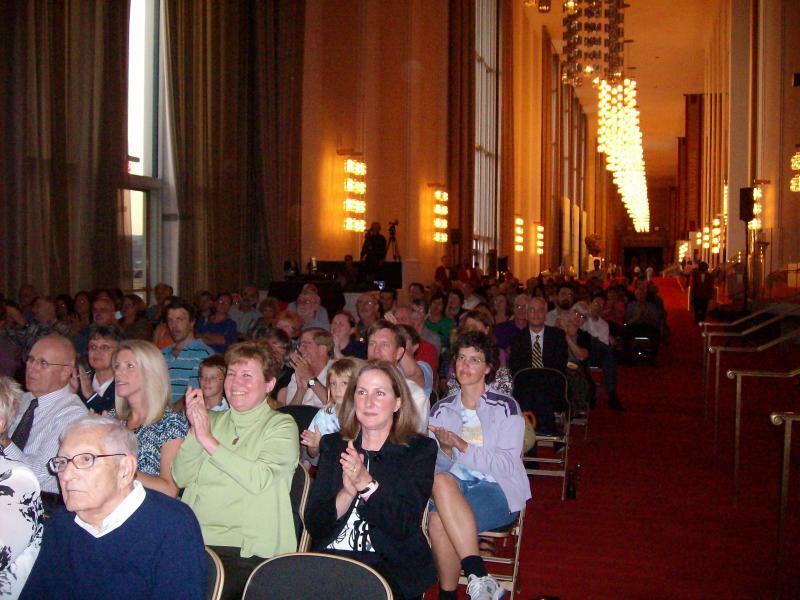 An appreciative audience packed the hall. 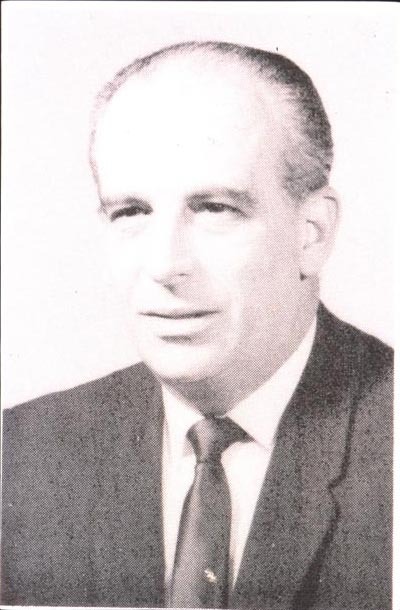 Zelich had directed the Petar Krstich Choir in the capacity of head choir director for 49 years and had been an assistant director for a few years before that. He also was the main organizer and director of our Petar Krstich Junior choir back in the 1960s. Mr. Zelich has composed 100 musical arrangements for Serbian Eastern Orthodox Liturgical church services as well as Serbian Folk, Patriotic and Love songs. Slobodan has always put the church and choir first in his life after his own family. This was his calling in life and his passion. Congratulations, Slobodan! We ALL love you! SAME DAY, DIFFERENT STATION! MAY 3, 2009! 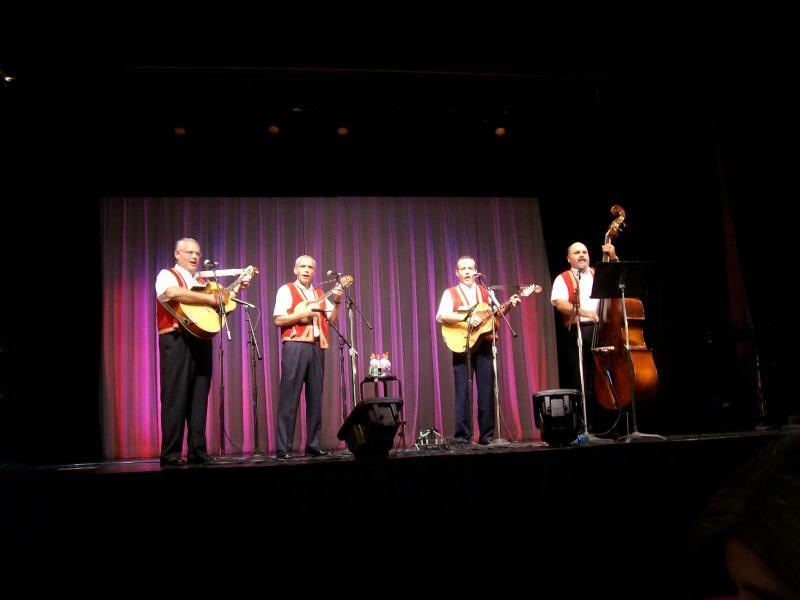 On Sunday, May 3rd, 2009, The Dunav Tamburitza Orchestra of Aliquippa, Pennsylvania were inducted into the Beaver Valley Musician’s Hall of Fame. This is an annual event held to honor musicians that have made an impact in their field and to award scholarships to high school seniors who are continuing in their study of music. Notable inductees are Henry Mancini, Nicholas ‘Nick’ Hayden and Donald Knezevich. Albin Abramovich, Stephen Kaurich, +Pete Esapovich and Robert Susnjer were recognized, by their peers, for their musical abilities as well as their contributions to and perpetuation of tamburitza music. What is most flattering is that this recognition is coming from musicians not associated to tamburitza music. It should be noted that the Dunav was the first Tamburitza Orchestra recognized by this organization. Congratulations to the DUNAV Tamburitzans! Did you know this? 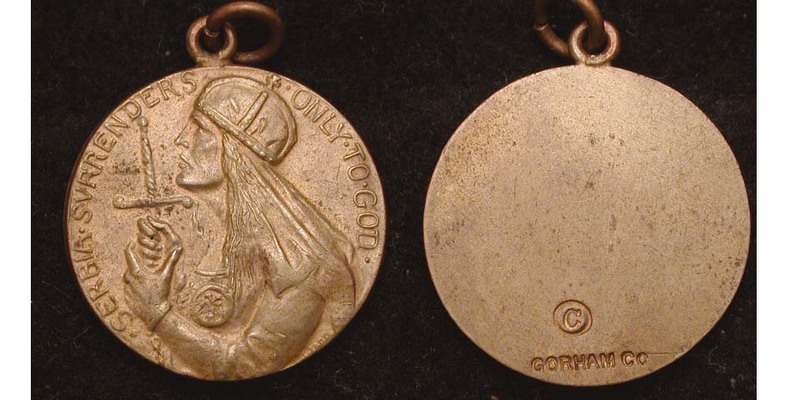 A lovely bronze medal was made in the United States in 1916 by the Gorham CO. that said: SERBIA SURRENDERS ONLY TO GOD. The Obverse featured the personification of Serbia through "Vila Ravijojla" with long hair under closed crown and the double-headed eagle medallion on her breast garment, holding an inverse sword, with the circular legend "Serbian Surrenders Only to God," with the signature of artist LADD along the lower right edge. The above information & photos below came from the RUDNIK Numismatics site from California. Click on rt.hand bottom corner to view larger image. Further research led me to find that the Smithsonian did an article on Mrs. Anna Coleman Watts Ladd in its Feb. 2007 issue called "Faces of War" by Caroline Alexander. God bless Anna Ladd! While her doctor husband was treating the wounded soldiers, she helped reconstruct the soldiers' faces with masks so that other people could stand the sight of soldiers without eyes or noses or parts of their cheeks, etc. Ladd lived at 270 Claredon Sst. in Boston and was said to be one of the city's most prolific sculptors. She made fountains and other sculptures for people from Boston, NY, Philadelphia and even throughout California! She was born July 15, 1878 and according to the NY TIMES, died June 3, 1939. Chalk up two more people who loved the Serbian people, the Serbian race! From my Kum Milan Markovich came this story about Nikola Tesla. Milan found this in a historical fiction novel called THE CHASE by Clive Cussler, on p. 197. "Telluride-the name supposedly came from the saying "to hell you ride" --was launched after gold was discovered in the San Miguel River. The gold, along with silver-bearing ore, found high in the San Juan Mountains, quickly attracted an army of prospectors and miners over the next fifty years. By 1906, more millionaires per capita lived in Telluride than in New York City. "When the sun dropped behind the mountains and darkness came, a blaze of lights flashed on up and down the streets. In 1892, mine owner L.L. Nunn had hired the electrical wizard Nikola Tesla to build the world's first alternating-current power plant to move ore on cables down the mountain and miners up from town. After running wires from the power plant into town, Telluride became the first town in history to have electric streetlamps." Today we celebrate the Serbian New Year, 7517. This is the oldest date in recorded history which places Hemos, today known as the Balkans, as the cradle of the civilizations. It predates Egyptian, Mesopotamian, Greek, Roman, Chinese and others. Of course, this is disputed in the West, which continues to treat us as a backwards people. 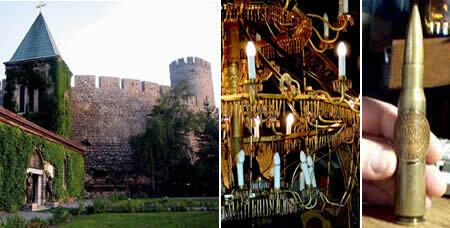 As an example, the inscription on the Smederevo Fortress seas that it was built by Djuradj in 6938. Reference to 7517 is also found in various written documents; While Despot Stefan was killed in 6935, Duke Lazar died on the Field of Kosovo in 6835. Existing written documents also quotes that, Milutin built a church for Joakim and Ana in Studenica in 6822, and Sveti Đorđije (St. George) Church in Stari Nagoričani in 6821. Serbs used letters to write numbers; however, the numeric value of letters bares no relation to Roman way of writing numbers. Serbian calendar, according to the number of recorded years, is the oldest calendar mentioned in world documents. Egyptian calendar dates back to 3200 B.C., Mesopotamian to 3000 B.C., Greek to the year of the first Olympic Games, Roman to the beginning of Rome, while Serbian to 7500 B.C. The origin of Serbian Calendar is related to the beginning of Agriculture (so called “starcevacka” culture). "Located over the Kalemegdan Fortress in Belgrade, Serbia, the Ruzica Church is a small chapel decorated with... with trench art! Its chandeliers are entirely made of spent bullet casing, swords, and cannon parts. The space the church now occupies was used by the Turks as gunpowder storage for over 100 years and it had to be largely rebuilt in 1920 after WWI. Though damaged by bombings there was an upshot to the terrible carnage of The Great War. While fighting alongside England and the US , Serbian soldiers on the Thessaloniki front took the time to put together these amazing chandeliers. It is one of the world's finest examples of trench art." Thanks to Dan (former Mayor of Aliquippa, PA) and his wife Janet Britza for sending me this information! From contributors Janice Dean and Dane Topich came this absolutely WONDERFUL photo of the Trbovich Family at (Serbian Day?) 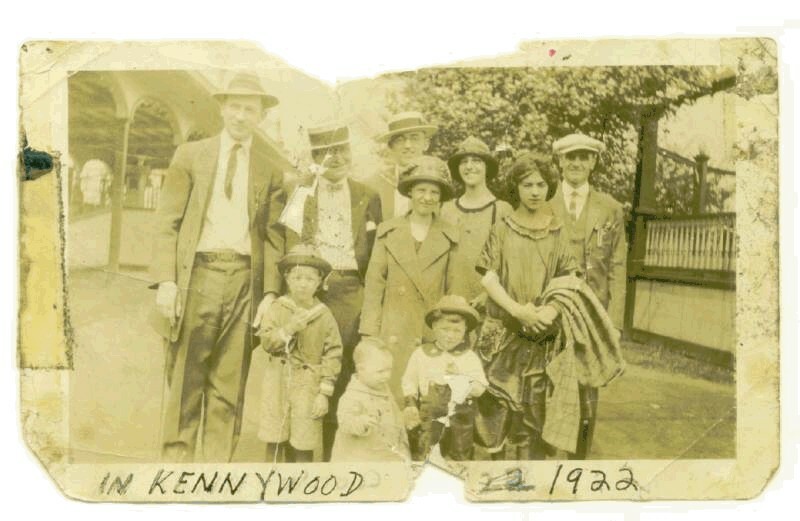 Kennywood in 1922! The Trbovichs shown here were from Tilford Road in Penn Hills. Donna Binkley (70) wrote: "My grandmother Mary Trbovich Sabock is the girl with the coats over her arm. Looks like it might be near the Jack Rabbit or Racers or near the Merry-Go-Round pavilion." Rudjer ("Ruggero") Boskovic is considered the FIRST Serbian Astronomer. His mother was Italian, and his father was Nikola Boskovic, a trader from Herzegovina, of the Serbian Orthodox faith, and descent from the noble Pokrajcic family from the village of Orahov Do in lower Herzegovina. Rudjer was born in Dalmatia, the seventh child in his family. He was so brilliant that he became a college professor at a young age, in 1740. Before that he had made a name for himself by finding a solution to the problem of finding the Sun's equator by determining the period of its rotation by observation of the spots on its surface. Consequently, he studied the transit of Mercury, the Aurora Borealis, fixed stars, application of mathematics to the theory of the telescope, cycloids, theory of comets, the tides, etc. He became an Ambassador to London in 1760, and was elected a fellow of the Royal Society. In 1761 he traveled to Istanbul, Poland, Bulgaria and then to St. Petersburg where he was elected a member of the Russian Academy of Sciences, returning to Italy when his health failed. In his later years, he continued his pursuit of scientific knowledge, and published his Opera pertinentia ad optican et astronomiam in 1785 in five volumes quarto. He died in Milan, where he is buried in the St. Maria Podone church. 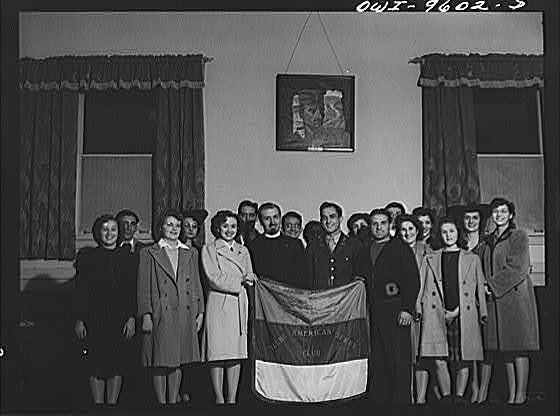 The American Serb Club in Butte, Montana proudly shows off its flag, with military hero behind, and above him, a portrait of Cica Draza Mihailovich. 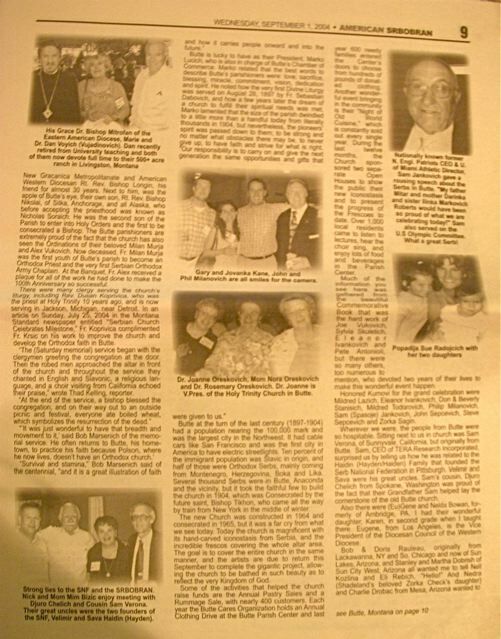 Here is an EXCELLENT article about Serbian Americans written by Bosiljka Stevanovic. It doesn't say where Bosilljka lives, and the only way to tell the date is that it was published when George Martich was President of the Serb National Federation, but other than those few minor details, it's a very well researched paper. Be sure to check it out! More about the Bajich Brothers in Washington! Click here to watch ONE HOUR of the Bajich Brothers in Washington, DC, on stage! Incredible! Thank you, Smithsonian & Fannie Mae Sponsors! 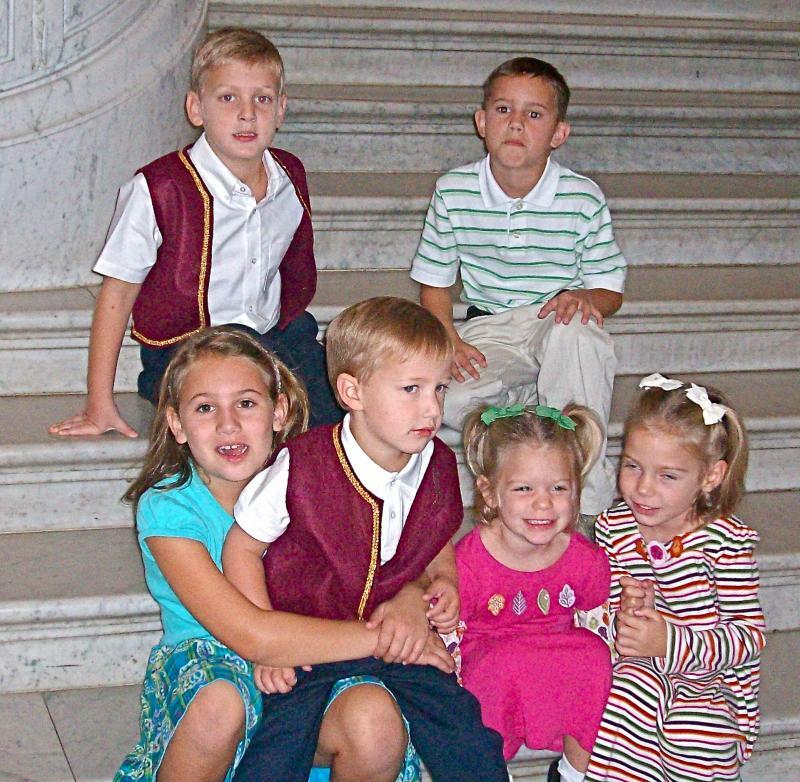 Do you think THESE KIDS will have had something to say when they got back to school? Congratulations one and ALL! You did us proud!!!! Alice and Claude married in 1900. They were so much alike in their thinking, they wrote their novels together, and prolific they were! More than 90 fiction books/articles were written from 1906 until their untimely deaths, but only one NON-FICTION book, THE STRICKEN LAND: SERBIA AS WE SAW IT. They had undertaken Relief Operations in Serbia and died together on October 17, 1917, when their ship was torpedoed in the Meditterrean! Steve Holland, from the United Kingdom, was gracious enough to share this photo of Alice and the titles of the Askew books. You can access his blog here. Claude Arthur Cary Askew was born in Notting Hill, London, in 1866, the second son of Reverend John Askew, M.A. 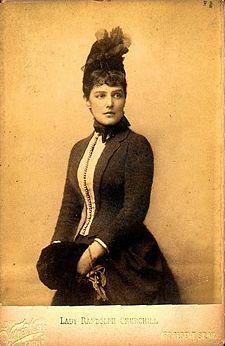 Educated at Eton and on the continent, Askew married Alice Jane de Courcey Leake (born St. Pancras, London, 1874, the daughter of Colonel Henry Leake). They died helping Serbia! "Vjecnaja Pamjat, Memory Eternal!" Here's a photo of Serbs from Aliquippa gathering for a photo after the Funeral Service in Aliquippa, PA. Note flags and banners. Butte Serbian Women's Drill Team won lots of awards! 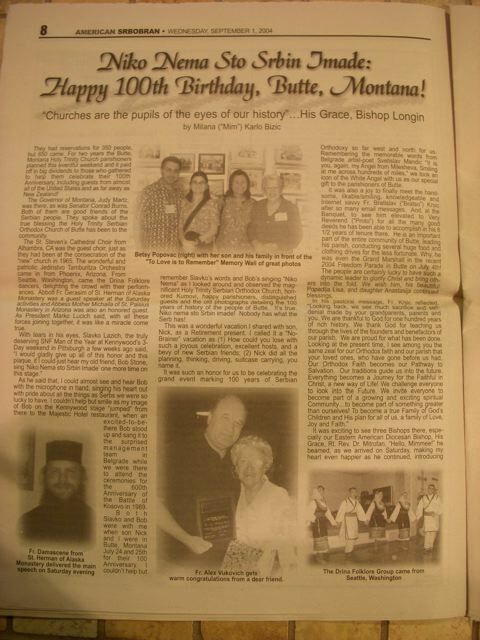 Butte Celebrants in 2004, and all with an SNF connection! 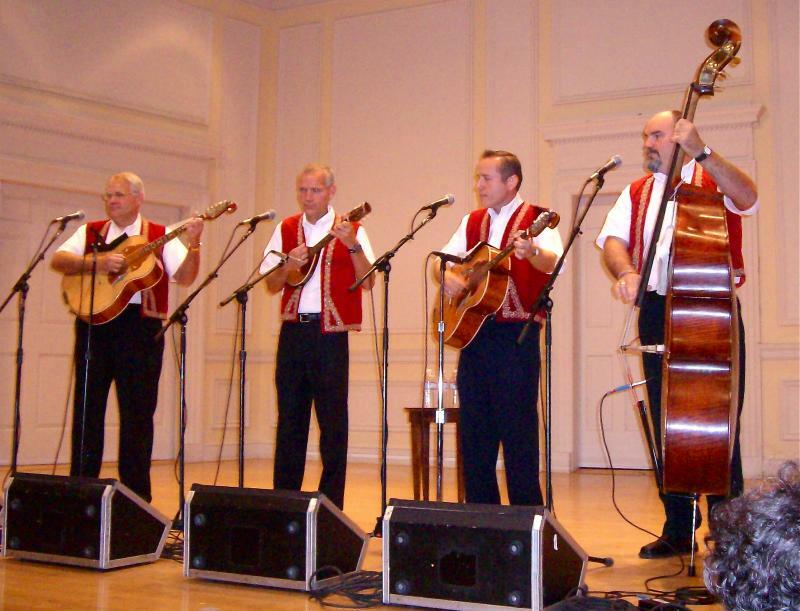 Sam Verona (far right) and his cousin (blue shirt), George Chalich from Spokane, are grand-nephews of Velimir and Sava Hajden, founders of the SNF. Mim and her son are proud of the fact that Mim's great-uncle and Nick's great-great uncle was Simo-Steve Mamula, also a member of the founding SNF family! "Churches are the pupils of the eyes of our history"- His Grace Bishop Longin; His Grace Dr. Bishop Mitrofan and Dr. Dan and Marie (Vuyadinovich) Voyich; Djuro Chelich and Sam Verona-cousins; the Kane and Milanovich families; the Oreskovichs, Dr. Joanne , Mom Nora, and Dr. Rosemary Oreskovich; Nationally known former New England Patriots CEO and University of Miami Athletic Director, Sam Jankovich. Sam also served on the U.S. Olympic Committee; Popadija Sue Radojcich and her 2 daughters. Fr. Nick Ceko, Montana Governor, Judy Martz and Marko Lucich; Jedinstvo Orchestra from Phoenix, Arizona and crowd; Fr. 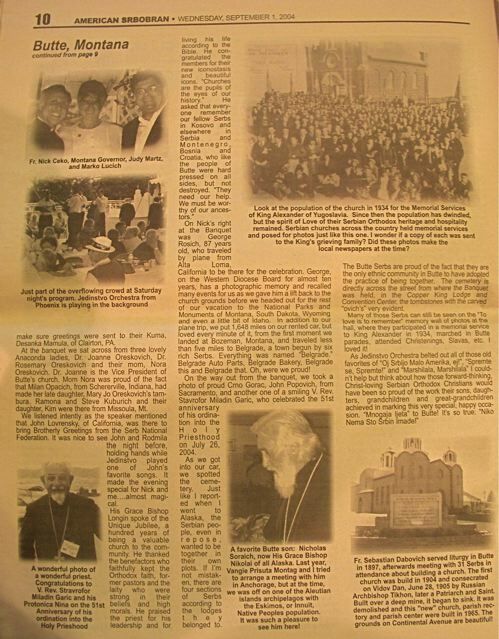 Miladin Aric on the 51st Anniversary into the Holy Priesthood; 1934 Memorial Services for +King Alexander of Yugosalvia; favorite Butte son, His Grace Bishop Nikolai of Alaska; Church-Fr. Sebastian Dabovich served liturgy in Butte in 1897, afterwards meeting with 31 Serbs in attendance to build a church. Built 1904, consecrated on Vidovdan, June 28 (Kosovo Day! ), 1905 by Russian Archbishop, later Patriarch and Saint. New church on Continental Avenue was built in 1965. The Dr. Laza Kostich Serbian Singing Society Choir celebrated its 72nd Anniversary on 10/25/2008 at the America-Yugoslav Hall in Midland, PA, while members of Aliquippa's St. Elijah Choir enjoyed the distinction of being honored guest choir. Midland's hospitality is always unsurpassed. 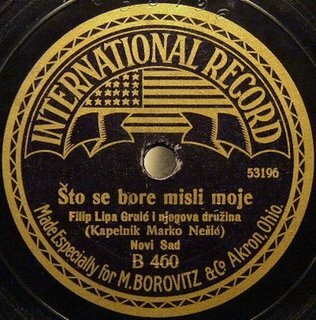 Click on the record album label above to hear this early version of "Sto se bore mislie moje." It's from the collection of Steve Kozobarich of Cleveland. Midland Choir led off with the old-time favorite, “Sto Se Bore.” But they brought the house down with their rousing “Moja Diridika” featuring their “SECRET WEAPONS” of the night….. the fabulous KRAH Sisters: Mallory (age 10), Karli (7), Macy (6) and Chloe (age 5)! Dressed in their little Beaver County Tamburitzan outfits complete with yellow babushkas creating “halos” around their angelic faces, and armed with a battery of talent and enthusiasm, they helped win the friendly “battle of the choirs” hands down! EVERYONE clapped thunderously for this marvelous little quartet of future Dr. Laza Kostich S.S.S. leaders! Congratulations to Ann Meriage who celebrated her 90th birthday in May, but was honored at the concert for being a Charter Member of the Choir since its inception in 1936. Ann was given a beautiful icon of the "Protection of the Holy Theotokos" and song tributes of "Zivela!" and "Mnogaja Ljeta!" Ann Meriage, 90 in middle, surrounded by good friends! Click here to hear the Midland Choir sing its special song of the night, "Marin Nam Dosa," under the direction of Evie Adams. The Serbs had many special friends, among them Peter (Pyotr) Ilich (Ilyich) Tchaikovsky who wrote MARCHE SLAV 1876 for a Red Cross charity concert to help fund purchasing shoes for Serbian soldiers who had none or had threadbare soles. Either through ignorance or on purpose, the title has been changed to read March Slave. 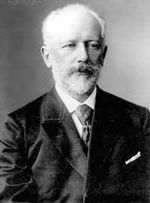 Tchaikovsky used many Serbian folk songs in his composition, also incorporating the Russian National Anthem in what he described as his "Serbo-Russian march." Especially interesting, Tchaikovsky performed MARCHE SLAV with the NY Music Society at the inaugural concert of New York's Carnegie Hall, his first time in America, 1891. Another special friend was Victor Hugo who gave his literary talents as well as money to help the suffering Serbian people. William Howard Temperly, the British historian wrote an excellent history on the Serbs in 1918. He said: "Perhaps there is no race which has shown a more heroic desire for freedom than the Serbs or achieved it with less aid from others or at more sacrifice to itself." Russian composer, Nikolia Rimsky-Korsakov, wrote a musical piece called "Fantasia on Serbian Themes, Op. 6," in 1867. Mily Balakirev conducted the first performed piece in May of 1867. It is also known as the Serbian Fantasy. In his movie, FANTASIA, Walt Disney supposedly gave $5000 to Rimsky's heir with a take it or leave it option since Disney could use Rimsky's msuic which had only been copyrighted in Russia, and not the USA. Rimsky took it. Is there any connection between the first Fantasia and Disney's? Just offered for thought. "I am reading a book about Jennie Jerome Churchill, Winston's American mother. 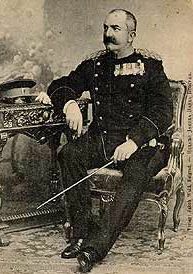 There is a photo of King Milan of Serbia. Seems he was an admirer of Jennie Churchill and arrived at her door almost daily with a box of gardenias for her and presents for her children. Among the surviving gifts is a tortoise shell music box with a tiny golden bird that pops out and sings. 'In Serbian, Milan's surname means bird.'" Wednesday, September 17, 2008, in Washington, DC! We always said that their Mother and Father had to be SOOOOOOOO proud of these guys and their musical accomplishments. Well, the WHOLE SERBIAN WORLD is proud of this next "gig." Congratulations, fellas, from all of us, your FAN BASE everywhere! 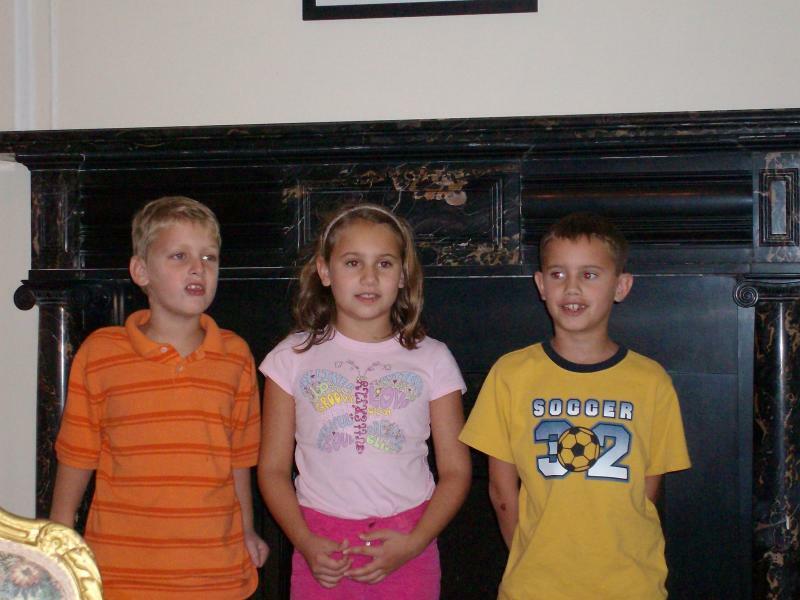 The Bajich Brothers went to Washington D.C., and WOWED them! Bozhi, Bati, Pete, and Paul Bajich of Kansas City have been playing tambura together for over 25 years all over the U.S. and Canada. They were invited to perform at the prestigious Library of Congress and the John F. Kennedy Center in our nation’s capital. 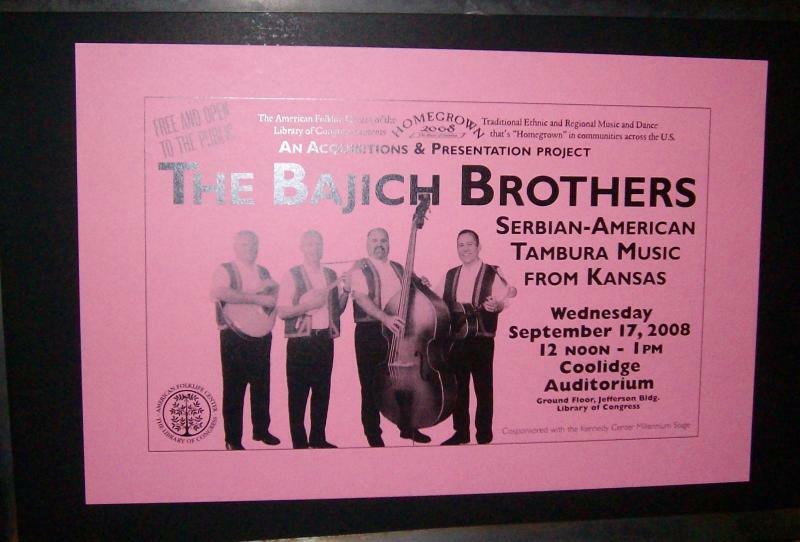 On Wednesday, September 17, 2008, the Bajich Brothers played a free noon concert presented by the American Folklife Center and the music division of the Library of Congress, and then later that same day, they gave an evening concert at the Kennedy Center. I know many of our folks were there to cheer you on, especially our little "Amelia." "Jelena Matic from the Serbian Embassy was at the the Library of Congress performance. She struck up a conversation with my mom because all of our kids (mine dressed like mini-Bajich brothers!) were running around and singing to all of the songs! She then wanted to meet the guys! So we introduced her. Jovi loved her and sat on her lap! She invited us to the Embassy. 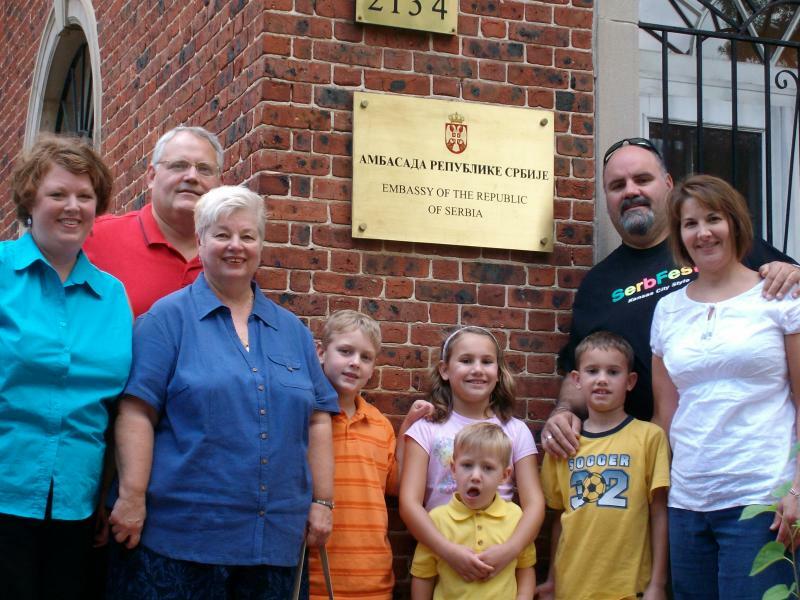 On Friday, the Bozhi Bajich family, and the Peter Bajich family went to visit the Serbian Embassy. The Embassy employees loved it! It was a true honor to have been invited there and also to visit with them and learn a little more about the Embassy here in America. We missed you Teta Mim!" YouTube video of V. Rev. Fr. Milan Bajich singing "Kudiar"
"In March of 1956, the parish welcomed Father Milan Bajich and his family to Kansas City. Father Bajich was instantly well received by the parishioners. With his renowned musical talents, one of his first duties he embraced was directing the choir. Father Bajich used these talents and his excellent musical training he received at the Sremski Karlovci Orthodox Seminary to reorganize the choir. Just nine months after his arrival, the choir became a member of the Serbian Singing Federation with the Holy Trinity Serbian Choir from St. Louis, Missouri serving as their kumovi in November of 1956. Proto Bajich retired as the parish priest in Kansas City in 1995 and announced his retirement as the choir director at the 58th S.S.F. Choral Festival in Phoenix, Arizona in 1999. Kansas City was blessed to have him as their spiritual leader of the church and director of the choir for more than 40 years. His commitment to the choir and the federation was acknowledge at the 60th S.S.F. Choral Festival in Omaha, Nebraska in 2001, where he was presented with the +Adam N. Popovich Directors' Award. Proto Milan Bajich continued to be an active member of the choir and church until his passing in 2004.﻿"
Just think of what HE added to the fabric of America! Ace Capuzzi's kids really know how to throw great retirement parties! They made their Dad's wishes come true with a Golf Outing/Picnic 1st class! Congratulations to Ace and his children/Junaci Orchestra! It was OUR pleasure, Ace! Mnogaja Ljeta, Mnogaja Ljeta, Mnogaja Ljeta! Dr. Mildred Ernestine Kaholamoana Stanley wrote a book entitled: A Tapestry of Memories, 1944. As a child, she was present when the Hawaii flag was taken down in 1898, replaced by the American flag when Hawaii was annexed. (Like Kosovo from the Serbs!) She was the child of missionaries serving in Hawaii, and went back to London for her medical degree. She practiced in India, Tibet, and combated polio near the Khyber Pass. She warrants being listed here as she served during WWI with the Serbian Army! Later she worked in Palestine, Syria, Fiji, New Zealand before retiring in Hawaii, recording her observations. Vjecnaja Pamjat to Dr. Stanley, Memory Eternal! 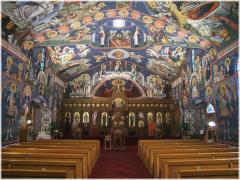 The Holy Trinity Serbian Orthodox Church in Butte, Montana, recently completed its FRESCO project that offers a beautiful explanation of all of the icons painted on the walls. "Icons have been called 'Windows of Heaven,' 'The Scriptures in Color,' or 'The Bible for the Illiterate.'" To learn much more wonderful knowledge about the icons depicted, click here. To see the incredible frescoes in a 360 degree look, click here. Hello to all of our friends in Butte! 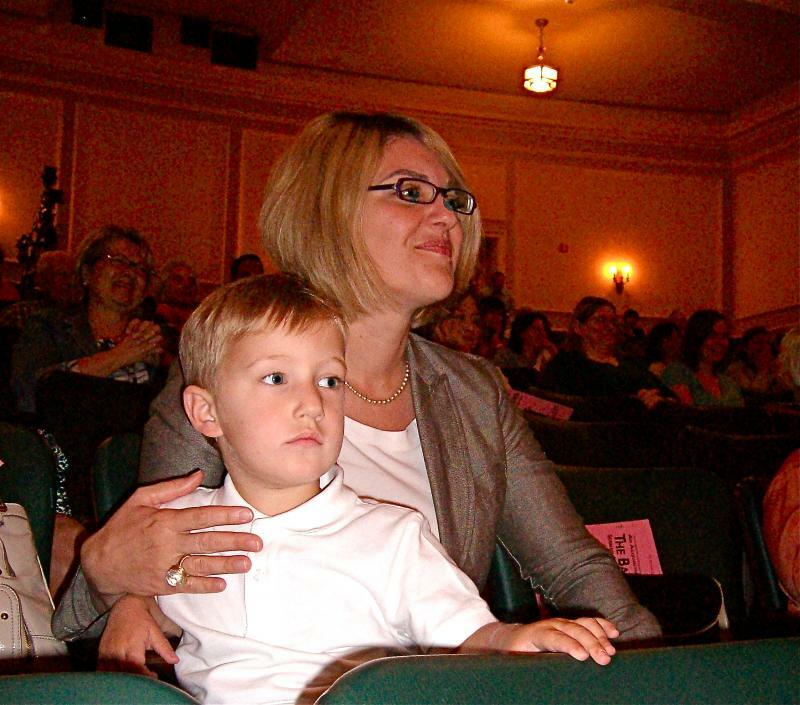 My son and I enjoyed being with you all for your 100th Anniversary in 2004! Only the altar was finished then. It's absolutely breathtaking now! Folklore group from the state of Washington! V.Rev. Fr. Miladin Garich joined the festivities too! You can't look at this photo and not smile also! Did you know that Robert De Niro, famous movie star and film director, named his daughter "Drina," in honor of one of his favorite novels “The Bridge on Drina River”, written by the Serbian Nobel laureate Ivo Andric? In a recent RTS interview, De Niro reiterated he was a great fan of Serbia’s best tennis player Novak Djokovic. “Maybe I’m part Serbian… somewhere in my history,” De Niro said, adding that “Djokovic is a great kid”. Like George V. said, "Just another reason to like him!" by M.M. Markovich, PRAVOSLAVLYE, No. 317, translated by Ned J. Marich, Gary, Indiana, June 5, 1983. 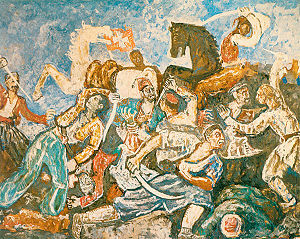 Legend states that after the Battle of Kosovo during which the military leaders of both sides were killed, Bosko remained alive and held his banner high at the head of the Serbian army. Later, he handed the same banner to his sister Czarica Milica. Exhausted and ailing, Bosko finally died, whereupon the grateful villgers laid him to rest and later planted nine stately oak trees symbolizing the nine Jugovich (Yugovich) brothers, Jug Bogdan and his nine sons who all died in the battle. In front of the church of Ivanica there is an inscription which reads: "The earthly remains of the knight-valiant of Kosovo, Boshko Jugovic, rest beneath these foundations which Blagoje Lukovich, a merchant of the town raised a holy temple for the glory and honor of Bosko Jugovic." Palibrchko Brdo dominates the surroundings of the rolling hills and it is said that if you listen closely, on a still night, you can hear the battle of Kosovo---of David and Goliath, being fought all over again. Anyone who studies history knows the importance of a flag to a battlefield. Bosko Jugovich saved the honor and dignity of his people by preventing the flag from falling into the hands of the enemy. In 1989, my sister and I saw the soldiers of KNIN dressed in beautiful narodni nosinje bring this special flag to Belgrade for the 600th Anniversary of the Battle of Kosovo in 1989. While speaking to several of the men, we learned that the flag is hidden and the men take an oath to rather die than tell where it is hidden. Mr. Marich continues: "We learn from this the fact that only the battle was lost, NOT the dignity and glory of the Serbian people, whose spirit lives on with a high moral commitment to Kosovo, handed down from one generation to another against any and all enemies who dare to invade this cherished freedom." 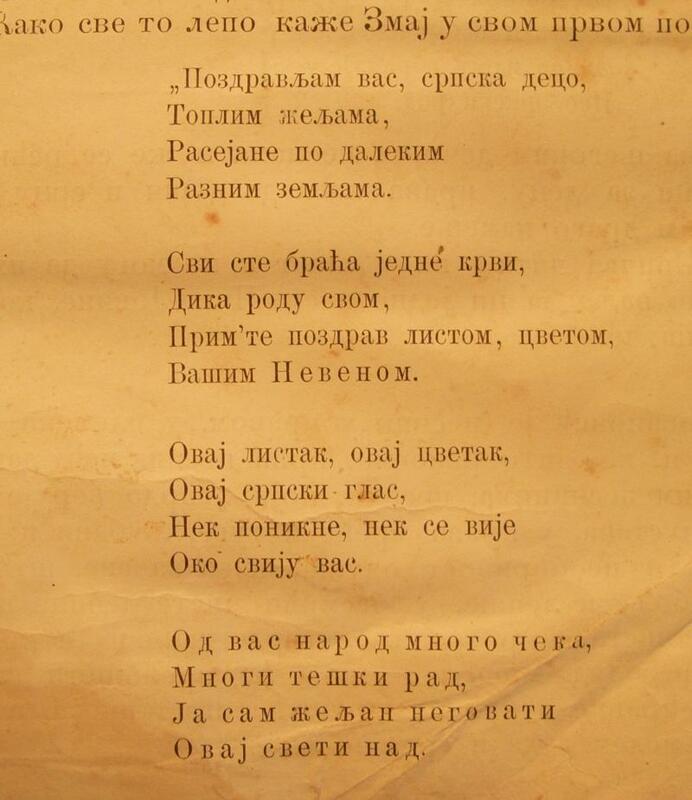 "Always the victims of invasion by the oppressor in past history, Serbian national poets and writers have sung praises and written about the sufferings of the Serbian people throughout the ages: 'Nurture and raise your son, then send him off to the army, for Serbia cannot and shall not die!" Mr. Marich also wrote about many consequent battles the Serbs fought valiantly from Kosovo to 1983, when this article first appeared. It was reprinted in 2004 because of the unfortunate series of events that befell the Serbian people. "I did this to serve as a friendly reminder to our young perople about the legacy that was handed down to them by our ancestors, Czar Lazar, Milosh Obilich, the Devet Jugovici, etc." Thanks, Ned! Old soliders never die! One of the most beautiful websites I've ever seen is this of the Alexander Palace, home of the Holy Martyred Romanov Family of Russia. This site was recommended by the National Education Association for good reason! When Serbian Prince Aleksandar Karadjordje was a young man, he served in the Court of Czar Nicholas of Russia. He became quite fond of Czar Nicholas' daughters, especially Princesses Tatiana and Olga, hoping to ask one of them for their hand in marriage. Here's another Zmaj poem that's a great one on Kosovo! Here's one on Baba Domisljanka---Baba Ana! 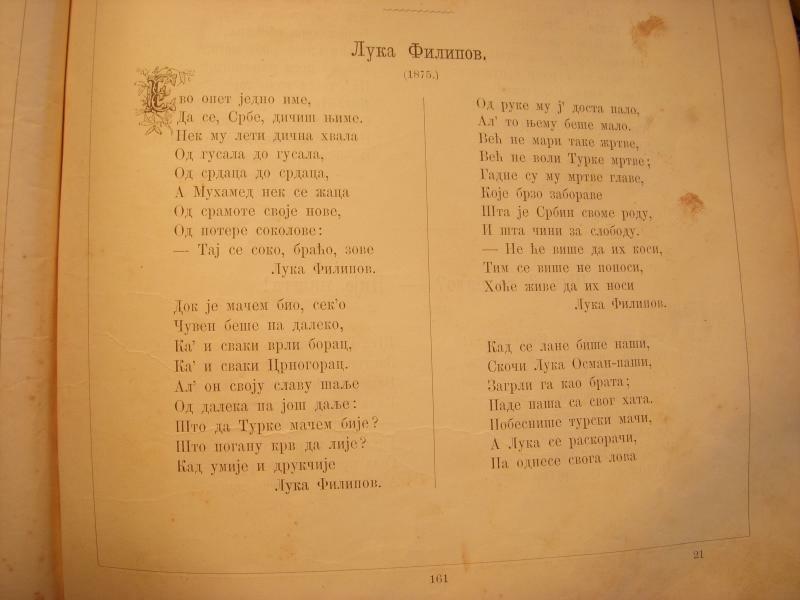 One of Zmaj's most famous poems is on Luka Filipov, which he wrote in 1875. 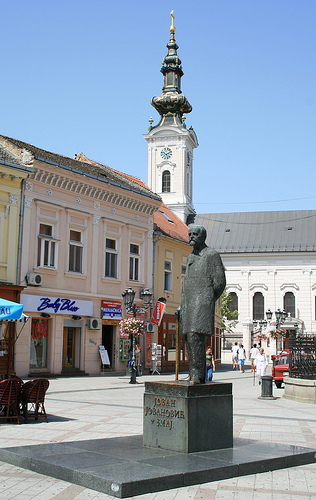 Statue of Jovan Jovanovich Zmaj in town square. Zmaj was born in Novi Sad, then part of the Austro-Hungarian Empire, on Nov. 24, 1833. Here's what the publisher had to say about Jovan Jovanovich Zmaj! Don't forget to click all photos to enlarge them for you! These links and the ones on the previous pages are being provided as a convenience and for informational purposes only; they do not constitute an endorsement or an approval by the webmaster of any of the products, services or opinions of the corporation or organization or individual. The owner bears no responsibility for the accuracy, legality or content of the external site or for that of subsequent links.